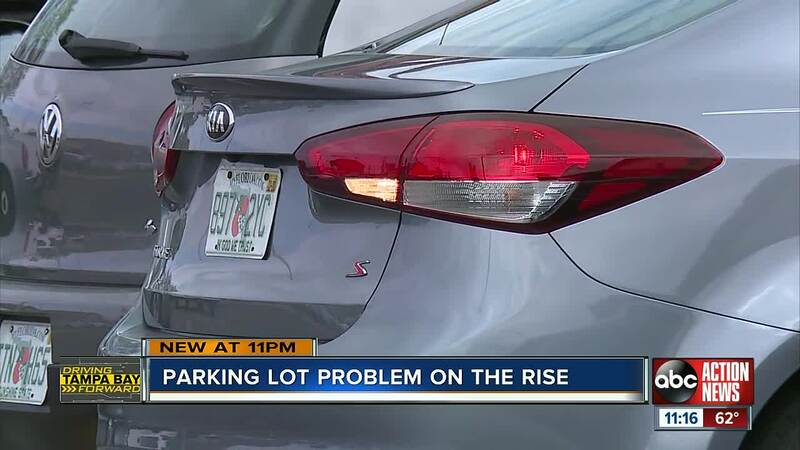 TAMPA, Fla. — Parking in the Tampa Bay area can sometimes feel like playing bumper cars in a maze. "If you’re not watching, God forbid," warns Judy Gowing. "I’ve seen some pretty scary things going on in parking lots," she says. "The car was coming from that direction. And she hit me about right here," Gowing said. "It left a bruise on my hip"
What happened to Judy is happening more and more in Florida every year. From a car slamming into a bank in St. Petersburg, a car crashing into a pizza store in Lake City, a van plunging from the fourth story of a Miami parking garage, to people getting run over in parking lots in Hernando County. Parking lot accidents are more than just fender benders in the Sunshine State. Thirty-two people died in parking lot crashes last year. Nearly 7,000 people suffered injuries. ABC Action News pulled the numbers going back four years for Hillsborough, Pinellas, Pasco, Polk, Hernando, Sarasota, and Manatee Counties. Data shows parking lot crashes are going up every year in the Tampa Bay region. There were 5,600 parking lot crashes last year. That’s up 16 percent since 2015. In fact, there were more parking lot crashes in our area than alcohol-related, motorcycle and pedestrian crashes combined. Guess where most of the parking lot accidents happen? International Mall in Tampa and Tampa International Airport. "There’s a possibility that drivers think that because they are off the main thoroughfares that some of the rules don’t necessarily apply," says Sgt. Steve Gaskins with the Florida Highway Patrol. Sgt. Gaskins says the physics of driving a two-ton car don’t change just because you are in a parking lot. “Even at a slow speed, this car, when it’s moving, you are looking at 5,000 pounds worth of steel and metal that if it rolls over you can cause serious injury and or death,” says Sgt. Gaskins. So what is driving the surge in parking lot crashes? Distracted driving. A new report from the National Safety Council found 66 percent of drivers nationwide admit they make phone calls while driving through parking lots. Fifty-six percent say they text. Half send or receive emails. And 49 percent say they take photos or watch videos while driving in parking lots. For a deeper look at the data behind driver behavior in parking lots, click here. To see how you can make your driving experience safer and less hectic in parking lots, click here.